The WORT 89.9 FM Madison, Wisconsin Area Classical Music Calendar for the Week Beginning 23 January, 2014 Compiled by Rich Samuels, Host of “Anything Goes”. Friday January 24, 12:15 pm at the First Unitarian Society, 900 University Bay Drive, Madison. Friday January 24, 7 pm at Wisconsin Institutes for Discovery, 330 N. Orchard Street, Madison. Sound Waves presents “I Got Rhythm! The Pulsations of the Universe” lecture/performance. Rhythm underlies the working of our bodies, the organization of our cities and the patterns of the universe. Join UW-Madison scientists and musicians L. Lee Eckhardt, Richard Amasino, Keith Woodward, Ellen Zweibel, Daniel Grabois and Johannes Wallmann as they explore rhythm. With a reputation in the community and among brass bands for innovative and entertaining performances, Madison Brass Band has a long history of entertaining audiences. Bavarian immigrant George Scherer founded the original Madison Brass Band in 1863. Its first members were businessmen, cobblers, cigar-makers, stone-cutters, and a saloon proprietor. Only one member was a professional musician. 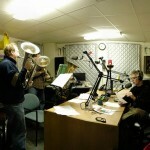 The band went into remission until 2002 when it was reestablished – since then the Madison Brass Band has become one of southern Wisconsin’s premier musical ensembles, sharing the unique spirit and beauty of the distinctive, mellow British-style brass band sound with a unique early American twist. The 30 piece ensemble has an active performance schedule including concerts and competitions. Most recently, in 2012, the band participated in the North American Brass Band Association Championships for the first time and was named Champions of the Second Section. MBB is directed by music educator and composer Craig Mason who generates a strong synergy throughout the band in every musical genre. Under Craig’s skillful direction the individual talent of even the finest player is often exceeded in context of the ensemble as a whole. Craig’s most sensitive interpretations in both his arrangements and conducting has won the heart of both player and listener alike. Don’t just take our word for it, come out and see for yourself! Sunday January 27, 2:30 pm at Overture Center-Overture Hall, 201 State Street, Madison. Antonin Dvořák’s Symphony No. 9 (“From the New World”) preceded by a special “Beyond there Score” presentation. We do expect a sell-out of this performance. The first half of this ingenious program, which was developed by the Chicago Symphony Orchestra, is an engrossing multi-media experience. With the full MSO on stage, John DeMain will conduct musical samples of Dvořák’s ideas, themes and influences, while narrator, actors, photos, and videos tell the story of how this symphony came to be composed. The second half is a full performance of the work. Wednesday, January 29 at noon at Luther Memorial Church, 1021 University Avenue, Madison. Organ Concert featuring organist Bruce Bengston.